When Louise and I relocated, we asked God to direct us to faith-filled doctors. The door of the examination room opened and a young doctor introduced himself. While looking over my medical history, he asked, “How are you feeling?” I said, “very well. Thank you.” I asked, “Are you a man of faith.” He smiled, looked over at me and said, “Yes. Christian”. As he examined me, we exchanged life stories.” At the end of my visit, we held hands and prayed with one another. There were tears and then we hugged goodbye as though we had been friends forever. The Christian author, Matthew Kelly, would describe this encounter as a “Holy Moment”. It was, for sure. It was also an answer to prayer. When I seek medical help, do I offer God’s healing mercies to those I meet along the way? Erica started working with us in her mid-twenties. She passed away a couple weeks ago at the young age of forty-one. The news of her death hit all of us very hard. She was a gem and loved by everyone that encountered her. The attitude in our office was all about Matthew 7:12. Erica not only lived that scripture out at work, but did so in every other area of her life, also. Lord, thank You for allowing me/us to be friends with and work alongside of Erica. Am I living my days wrapped in Matthew 7:11? This scripture reminds me to be alert for the urgings of the Holy Spirit and that God gave me two ears to hear for good reason. On the day of Louise’s surgery, I planted myself in front of the waiting room monitor, which kept me informed about where she was each step of the way. A couple questions to the man sitting next to me opened up a transparent exchange in which I became God’s ears. The man poured out his heart and then allowed me to pray with him. The next morning, we were blessed by an impromptu visit from one of the hospital Chaplains. Within minutes, there was a realization that God was using this visit in an unexpected way. By listening and opening our hearts to the Chaplain, he revealed that our visit gave him clarity to one of his recent prayers. God loves when we use our voice for His glory, but loves it just as much when we have ears to hear the cries of His people. Are my ears God’s ears? Posted in Books of the Bible	| Comments Off on “Ears To Hear”? “Strength For The Weary” ? My wife Louise went into the hospital Tuesday morning for full knee replacement and things went well. She is home recovering now. We only had three hours of sleep, the night before surgery. The medical team asked us to be at the hospital by 5am. Louise and I should have been dragging, but somehow we felt refreshed. We had prayed earlier asking God to empower us to see opportunities while at the hospital and grab hold of them for Him. Over the next three days, God used us to minister to a number of medical staff, patients and visitors. God did all of the introductions and energized us to handle all the work He wanted us to do as well. It was an exceptional hospital stay. More than anything, we were beyond blessed. P.S. Thanks for your prayer support and good wishes. Am I using every opportunity to fulfill God’s purpose for my life? Posted in Books of the Bible, Uncategorized	| Comments Off on “Strength For The Weary” ? The divorce rate in the United States is between 40% and 50%; about 10% more for California. Divorce for first time marriages happen within eight years; second marriages are less than that. Sixty percent of the divorcees are age 25 to 39. I could have been among these statistics. I was 35 when my marriage did not look salvageable. That is when someone told me that the key to marital success was a four letter word. I thought that word was L O V E. The word was then and still is W O R K.
The world is better equipped these days than it was back in the 70’s/80’s. There are workshops, conferences, support groups and a list of other things available to couples, now. One of those things is called “Retrouvaille” which means “Rediscovery”. This workshop is given by couples who were separated or divorced, but are now doing the “WORK” required to build a strong marriage. Am I doing the WORK it takes to have meaningful relationships? Am I doing the WORK it takes to have a relationship with God? Am I an encourager to others struggling in their relationships? Isaiah 58:11 “Bone On Bone” ? What a prophetic scripture for someone with a debilitating injury to any of the human joints; knee, hip, shoulder, neck, etc. The first knee replacement happened around 1968, with implants lasting about ten years. The current procedure is less intrusive and the implants last twenty to thirty years. On March 19, my wife will undergo full replacement of her right knee, which is presently bone on bone. The surgery will take about two hours, an hour in recovery and a one or two night stay in the hospital. She will have three weeks of no driving and a few months of physical therapy. Total recovery time is between three and six months. We solicit your prayers for Louise, the surgeon and all the medical staff prior to, during and after surgery, please. We are praying for no interference from the evil one, no pain, no complications, no clotting and a speedy recovery. This scripture rings true for Louise and so many others who, once again, have an opportunity to live their lives pain-free. Am I thankful to the Lord for always being my guide, satisfying my prayer requests and for strengthening my bones? Louise and I were in Chicago last week for her parent’s 75th wedding anniversary. It was incredibly moving. The above scripture rattled around in my head, while I assisted him. As I knelt down to put on his socks and shoes, I thought about Jesus washing his disciple’s feet. I was emotionally and spiritually touched, but somehow managed to hold back my tears. I was humbled and yet so honored by this opportunity God had bestowed on me. Will I allow someone else to dress me when I am too old to do so? Have I asked God for the opportunity to dress someone who is unable to do it for themselves? Luke 15:4 “One Lost Sheep”? Last year, Louise and I handed out over seven hundred copies of Matthew Kelly’s book titled “Resisting Happiness”. Those people, who actually took time to read it, were challenged to say the least. So far this year, we have handed out over eight hundred copies of Matthew Kelly’s newest release titled “The Biggest Lie In The History Of Christianity”. Several people have told us how touched they were by reading it. Not everyone who receives this weekly “Challenge” reads it. Not everyone will read the books we give out. God is searching for the one person who will, though. It is through that one conversion experience and testimony that God can reach the other “Ones” who want to be found. God is always looking for the one lost sheep. Recently, I got off the freeway at an exit I had never used before. I stopped at the red light and then proceeded to make a right turn. Seconds later, I noticed the flashing lights in my rear-view mirror of a Highway Patrol vehicle. I pulled over, rolled down my window and waited as the officer approached. Upon the officer’s request, I produced my license and registration. He asked if I noticed the “No Right Turn On Red” sign. Truthfully, I said, “No officer.” He asked, “Have you ever gotten off at this exit before?” “No sir. We were trying to find a new Italian restaurant on Main Street.” He said, “it’s down about a mile and right across the street from the police department.” We both smiled at that point. He handed me back my license and told me to have a nice dinner. Unintentionally, I had done the wrong thing, but I did the right thing by telling the truth. Do I see those in authority as God’s servants for my good? Posted in Uncategorized	| Comments Off on “Oops! Wrong Turn” ? Louise and I will be in Chicago for a few days later this month for her parent’s 75th wedding anniversary. On their wedding day, Angelo was 21 and Josephine was 18. 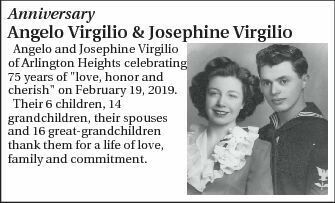 Their six children, fourteen grandchildren, their spouses and sixteen grandchildren will be there to thank them for their life of love, family and commitment. They are not only still married, but are also raising the bar for the rest of us. Thank you both for your yes to God, one another and to all of us. Blessings and love. Do I take my commitments seriously?